I recently purchased a new 2018 13″ MacBook Air—my first new Mac laptop in over five years. My hope is that this machine can replace two aging laptops: A 2013 13″ Retina MacBook Pro (I use this when I want more “power” or screen resolution) and a 2012 11″ MacBook Air (I use this when I want portability). Reviews of this machine are all over the net, so I’m not even going to attempt a full review. If you want an in-depth review of the machine, go read Six Colors’ review, or The Verge’s review or Wired’s review…or just start with Macrumors’ round-up of reviews and go from there. Instead of a full review, I’ll provide some brief thoughts on the machine, then move on to my main focus: The performance changes in Apple’s smallest laptops from 2012 to today, based on comparisons between my three machines. I was interested in how this would turn out, as the two older Macs are both Core i7 CPUs, versus the Core i5 in the new Air. There’s lots out there to read about how the 2018 Air compares to other current machines, or semi-new machines…but I thought it might be interesting to see how performance has changed in five-plus years. The 2012 11″ Air is on the left, the Space Gray 2018 Air is in the middle, and the 2013 13″ MacBook Pro is on the right. TouchID is wonderful; I hope more apps gain support for it as time passes. Battery life has been amazing, too. I also really like the color, though I do miss the backlit Apple logo. Something else I miss is Mag Safe on the power connector: It’s a real pain having to hunt for a port in a dark room, and I dread what happens the first time I trip over the cord. The power cord is also much shorter than before—maybe 6.5 feet versus about 12 feet for the older machines. Maybe Apple figures you’ll be less likely to trip on the non-Mag Safe cord if it’s not so long? And no, I wasn’t pounding any harder on the 2018 Air’s keyboard than I was the other two. So yes, it’s much louder, but it’s not so loud that it bothers me. I’m not sure if others seated nearby will feel the same, though. Overall, I’m quite happy with the machine, especially the fact that it has actual function keys and no stupid Touch Bar. (Dear Apple: I’d trade this in on a top-of-the-line MacBook Pro if you offered one without the insanity that is Touch Bar.) Enough of the review…time to look at the evolution of performance over five years’ time in Apple’s small laptops—at least those that I own. What I really want to dive into is a comparison of the new Air’s performance against my two older machines: How much have CPUs, GPUs, and disk drives changed in the last six years, particularly in Apple’s smaller laptops? Here are the specs of each of my small laptop Macs—all three are running macOS Mojave 14.1 (though the 2018 Air has the recently-released Supplemental Update version). What stands out in that table—to me, at least—is the change in power requirements over the last six years. The Core i5 in the new Air has a TDP value of just seven watts, versus 17 watts in the 2012 Air and a whopping 28 watts in the 2013 Retina MacBook Pro. Just looking at that figure, along with the lower frequency and “one class down” Core i5 vs Core i7, you’d tend to think the new Air probably has a slower CPU. 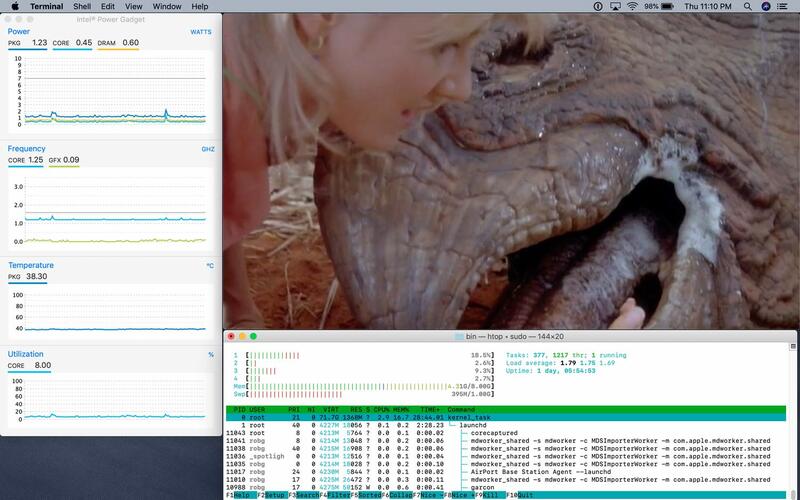 To see how fast or slow the new Air really is—not just its CPU but also disk and graphics (GPU)—I ran a slew of tests. Before I get to the results, though, a word about my benchmarking: It’s really basic. I don’t have the time to run multiple passes of every test; I don’t have the time to reboot each machine between every test, into a a new fresh user account, etc. Instead, I ran each of the following tests once, and did so on the main account on each machine. (If I got some results that appeared to be really out of line, I’d run the test again to confirm, but this only happened with two tests.) No other apps were running, but things like Dropbox and Moom and other small utilities were still active. I left each display in its actual native resolution (1280×800 for the two retina machines, and 1366×768 for the 2012 Air, as that’s all it can do). I was fine with these limitations, because I was interested in general high-level comparisons not ultra-specific results—and the same set of utilities/apps were running on each machine. So what you read here will probably differ from what you find on other sites that do more rigorous testing. And now, on to the results. OpenSSL “is a robust, commercial-grade, and full-featured toolkit for the Transport Layer Security (TLS) and Secure Sockets Layer (SSL) protocols. It is also a general-purpose cryptography library.” At least, that’s what it says on their web site. For my purposes, I like that OpenSSL is built into every version of macOS, and that it includes a nifty little benchmarking tool: In Terminal, just type openssl speed and then wait a while. The test uses a number of cryptographic hash algorithms with various block lengths to test the speed of those algorithms. As you can see, the new Air’s CPU—despite drawing much less power—is about 20% faster than my 2012 Air, and 5% faster than the 2013 Retina MacBook Pro. Impressive. CPU results with Geekbench mirror those of the OpenSSL speed test, though the new Air showed more improvement against the 2013 MacBook Pro than it did in the OpenSSL test…and simply crushed the 2012 MacBook Air in the Compute categories, seemingly a reflection of a much better GPU. Cinebench is a benchmark that tests both the GPU (using an OpenGL animated car chase) and the CPU (by rendering a photorealistic 3D image). The OpenGL results again show a strong performance from the GPU in the new Air, while the CPU test shows little to no improvement on the CPU side. But remember, the Air is doing this with half the power draw of the old Air, and one quarter that of the MacBook Pro. The advances in solid state “drives” in the last six years is evident in these results—and a fast disk contributes a lot to the overall feel of the machine’s speed: Apps launch quickly, and even if you have to use swap space on “disk” when you run out of RAM, it happens so quickly you may not even realize data is being swapped. Heaven is a 2009 OpenGL benchmark test that still runs fine on today’s hardware. The benchmark runs through a number of animated 3D scenes, and at the end, returns an average frames per second and a score, based on the average FPS as well as the high and low FPS. Test notes: I ran the “basic” test, in a window, with no default settings changed, and each machine running its native resolution. When I first ran this test, I got some very strange results: The new Air was no quicker than the 2012 Air, and was crushed by the 2013 model. I ran it again, and got the same results. Then the 2018 Air’s 10.14.1 Supplemental Update came out. I installed that, and re-ran the tests, and got the above results: The new Air nearly doubles the frame rate of the old Air, and is slightly faster than the 2013 MacBook Pro. I have no idea if there was some graphics-related fix in the supplemental update, or if simply installing the update and rebooting cleared something out, but these results are more in line with what I expected given the GPU performance in other benchmarks. Valley is the 2013 follow-on to 2009’s Heaven. Again, I used the “basic” test running in a window at each Mac’s native screen resolution. My first run here was the same as with the Heaven test: The new Air did horribly (even after a fresh boot). After installing the supplemental update and rebooting, the scores improved dramatically. My results here didn’t change before and after installing the supplemental update, which seems to imply that perhaps the issue was with the OpenGL driver. But who knows for sure. With the exception of the Driver Overhead 2 test, the new Air was quicker than the MacBook Pro in every test. I was quite impressed by the Air’s benchmark results: Using a CPU with much lower power draw, it held its own against older but arguably more-powerful chips—besting the 2012 Air by a lot, and slightly outperforming the 2013 MacBook Pro. In the disk and graphics areas, there was no comparison: The new Air has a wicked-fast solid state drive, and (at least after the supplemental update) the graphics chipset is notably faster, too. That is impressive performance with minimal power draw…which should translate into longer battery life, amongst other things. But so much for benchmarks, what about real-world usage? I’ve used the Air quite often over the last week, as I was out of town for four days, so I took it with me. (I had the other two as well, so I could work on this writeup). In my real world typical use—email, web browsing, editing HTML and CSS in Coda or Atom or in a browser, more email, some graphics editing, a bit of screen recording work, etc.—it’s clearly much faster than my two dinosaur-era small Macs. Apps open instantly, and even if I load the thing up so it has to use virtual memory, the solid state drive is so fast that it’s almost a non-event. I wanted to run some tests on app launch times, so I did…but all three machines launch apps so quickly that it’s basically a non-event. At best, I got about a one-second difference between the 2012 and 2018 Airs when launching four apps at the same time. So much for that as an area of focus. Next, I wanted to get a sense for real world battery life across all three machines. But as with the benchmark tests, I don’t really have the time to do it right, i.e. seeing how long I can run all three machines until they shut down. Instead, I created a one-hour test, then compared results at the end of that test period. In a nutshell, the new machine crushed the other two—nearly eleven hours remaining, against 2.5 for the old Air and just over six for the MacBook Pro. The short run time for the 2012 Air, with its smaller 35 watt-hour battery, isn’t overly surprising (though 3.5 hours of total usage time is quite short). The 2013 MacBook Pro, though, has a 50 watt-hour battery…yet the new Air’s smaller 35 watt-hour battery has no trouble outlasting it. Of course, there’s another variable here, and that’s the age of batteries. To check the condition of the older machine’s batteries, I used ioreg -brc AppleSmartBattery, which dumps a ton of info about the battery. In the output, the DesignCapacity field shows what the battery should have held when new, and MaxCapacity shows what it can now hold when fully charged. If there’s a big gap in those numbers, then the battery isn’t capable of holding much charge. For my 2012 Air, the ratio is 4075/4680, or 87%; for the 2013 MacBook Pro, it’s 5707/6330, or 90%. So while both batteries are down, it’s not enough to explain the disparity. And even if they were both at 100%, there’d be no comparison with the new Air’s performance. For me, given the age of my other two laptops, this upgrade is a no brainer. I get a much better screen, a lower-power-drawing CPU that nonetheless outperforms the other two machines, better graphics, and a seriously long-lasting battery. And did I mention it doesn’t have a Touch Bar? This machine will easily replace both of my others, and hopefully last at least as long with me as the first two have. If you’ve got a newer Air, though, it’s a tougher question. The CPU, GPU, and disk probably aren’t all much quicker than they were two years ago, so you’ll have to judge if the retina screen and longer battery life make the new Air a worthwhile upgrade. I think I am finally seeing the replacement for my 2009 MBP. Thank you for this impressive and detailed review. I had the 2014 MacBook Air 11″ and was considering purchasing the new 2018 MacBook Air 13″ as a replacement. My concern was to keep at least the same performance, but get the Retina Screen and Touch ID, not compromising too much on size and weight, since the 11″ was perfect to carry around. Now I have no doubt this should be my next upgrade. Thanks for the feeback; glad you found it useful. Very useful summary, thanks. My beloved 2012-MBP is on the fritz, and I’ve been in two minds if I should get the Air or not; the benchmarks are a pleasant surprise. How are you getting on with the keyboard? Any issues? Other than the loudness, I haven’t had any issues with the keyboard. Excellent review! It’s almost like you wrote this review for me, as I have a 2011 13” MB Air and a 2013 13” MB Pro that are both getting to their end of useful life… your real-world benchmarks are much more useful than the synthetics on a lot of other sites. Thank you!